Accidents always happen at the most inconvenient time, like on the weekend or at night. Sometimes it is difficult to get to a vet straight away and you need a dog first aid kit. If your dog gets injured and you don’t have anything ready to stop the bleeding or ease the pain, you’ll be stressed and anxious about your dog and find it very difficult to deal with. I know, I’ve been in that situation. These days I have pet bandages ready to go, as well as ClotIt to stop bleeding. I also keep a full dog first aid kit with me at home as well as in the car. We don’t go camping, but if we ever do, I’ll be sure to upgrade my dog first aid kit to carry even more bandages and other items. I wouldn’t want to put my pup at risk. For any dog owner, it’s important that you always have a first aid kit if anything goes wrong with your dog. 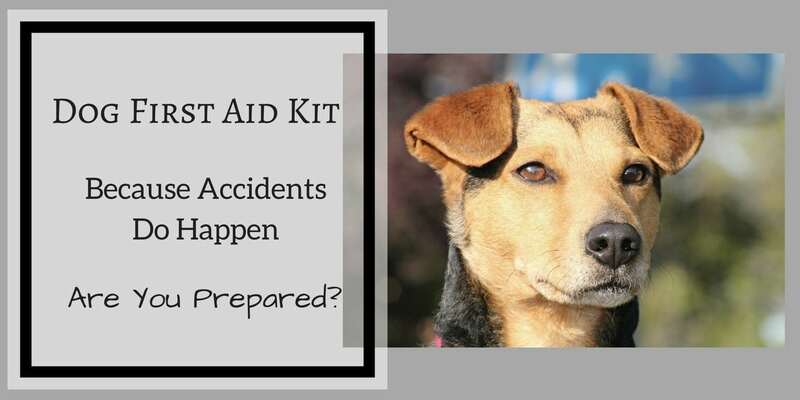 Items in first aid kits will mostly help with flesh wounds, but there is some medication that you can keep in your kit to help your dog as well. First aid kits allow you to quickly treat your dog in a dire emergency, before you can take them to an emergency or regular veterinarian. If you don’t have any medical experience, it would also be beneficial to take a first aid class, so when the time comes that you need that kit, all of the tools won’t be useless. What Do I Need in a Dog First Aid Kit? First, you’re going to need items for any cuts, gashes, or nicks. For this, you don’t want to use regular adhesive bandages like Band-Aids. You want to use the non-sticking bandages that you can wrap around the wounded area, so when you or the vet takes it off, it won’t take a big clump of fur with it. Be sure to have gauze in case of any bleeding injuries. You should also have some blood clotting solution or powder, so you can stop the bleeding faster. One good product for stopping bleeding is ClotIt, who actually sells a full animal first aid kit in addition to their blood clotting products. These are some of the basic items to make sure you include in your dog first aid kit. Every dog is an individual and keeping this in mind, be sure to include any particular medicines your dog may need in an emergency. What else to I need to consider for a dog first aid kit? It’s also important to take your dog’s age into consideration. For puppies, bleeding injuries are more serious, because they have less blood in them. It’s extremely important that you stop any continuous blood flow immediately on your puppy. Puppies may also be more likely to have a conniption when you’re trying to treat them, so a few tranquilizers may be useful as well. Be sure that the tranquilizers aren’t too powerful – you don’t want your dog to overdose on medications that were meant for 100+ pound dogs. For adult dogs, tranquilizers shouldn’t be necessary if you’ve raised them to be calm. However, if they’re still rowdy and rambunctious, have some appropriately dosed tranquilizers in your kit. Tranquilizers can help you wrap wounds where your dog may not like being touched. For example, if your dog is sensitive about having its legs touched, then it may bite and be uncooperative when you’re trying to wrap it while they’re scared and in pain. For older dogs, it would be best to just add on to your adult dog kit, and bring some medications for them if they get sick. If you participate in certain outdoor activities with your dog, consider getting a specialized kit. For camping there are kits with extra items you may need when you’re further afield from a vet. If you are keen on hiking with your dog and you’re worried about snake bites, educate yourself on the steps to take and include extra items like pressure bandages in your dog first aid kit. For hunting you’ll need to be sure you have enough blood clotting gauze pads. These can be pushed into a wound to stop the bleeding. If it is a large wound you don’t want to be caught with only one special gauze pad. You may need more to try and stop the bleeding. Extra bandages would also be a wise idea to wrap the wound with pressure and hold the blood clotting gauze pads in place. You can buy specialized dog first aid kits for your favorite activity. Alternatively, many pet first aid kits allow extra room in the zip up kit for you to personalize the kit yourself. In summary, don’t wait another minute. If you own a dog, get online and order a dog first aid kit today. And if you already own a kit, consider updating it to suit your dog better. Every dog owner needs to take responsibility for their dog’s health. And owning a first aid kit is part of this. If you’re getting your first puppy soon, buy the first aid kit now. And if you already have dogs, act quickly. Make sure you get that first aid kit in your house or car as soon as possible. It really could make a big difference to the life and wellbeing of your dog. ☑ Do you suspect your dog has food allergies? You’ll be surprised by the symptoms. Read more here. This entry was posted in Dog Health on July 18, 2017 by Didi.